Danielle Woodruff has been employed with Ability360 since June 5, 2014. She was originally hired on to be a caregiver for her grandmother. Her grandmother passed away last summer and Danielle decided to become a general caregiver and take care of other consumers. As soon as Danielle was placed with other consumers, the consumers were calling to report how happy they were to have her. Her consumers describe her as being a “godsend” and “incredible”. Danielle is a single mom of six children. But even with all of that, she is reliable and often stays past her shift. She is currently in school to become a nutritionist. On her weekends, Danielle goes to Costco and shop for herself and her consumers. She enjoys cooking fish for her consumers and even making them “Protein Ball”. Her consumers say that her healthy cooking has been helping them to feel better and more energized. If Danielle’s consumers are in the hospital, she will visit them almost daily. Currently, one of Danielle’s consumers is in a hospital about 30 minutes away. Danielle drives there everyday to give the consumer a bed bath and to make sure her sheets are changed. Danielle states that she treats the consumers just as though she would have treated her grandmother. Danielle has a very kind heart and has gone far above and beyond her role as a PCA. Danielle was nominated by her supervisor Saige Raio. Christella has proven to be a valuable employee for HCS, she has provided nothing but excellent service to all consumers she has been assigned to. Christella has provided services in several supervisors’ regions. Her first and foremost understanding with all consumers and consumers families is that she goes strictly by HCS policies and procedures, “strictly by the books”. Christella rarely refuses an assignment and if she does it is for a good reason. She is so dependable, knows her job well and is a self-starter. Christella assesses her consumer’s situation then takes charge. Christella has been consistent for nearly a decade, and it is high time she is recognized for her diligence and excellence in her employment. All supervisors that have had the pleasure of supervising her can attest to this accommodation. Christella was nominated by her supervisor Kathy Starr and Shondra Taylor. Sharon Ronquist has been employed since Jan. 28, 2015. Since starting with the company, Sharon has only cared for high level consumers, all of whom require a full transfer with a Hoyer lift. Sharon is 70 years old, but has more energy than the majority of my caregivers. She is now working seven days a week, with a split shift everyday. Both of Sharon’s consumers are married men with M.S. Sharon has so much empathy for her consumer’s wives and is always willing to go the extra mile and sacrifice her time, just to help the families. Her consumers say that no one compares to her, and decline back-ups if she requests a day off. The wife of one of Sharon’s consumers stated that without Sharon, her husband would have to be in a nursing home because she knows that no other caregiver would be able to do all that Sharon does. Sharon has a positive attitude and really helps encourage her consumers to stay positive, even as they both continue to decline. Sharon was nominated by her supervisor Saige Raio. I want to nominate PCA John Juarez for employee of the month due to the dedication in providing his consumer and wife Enedina Juarez care since 2007. Enedina’s daughter Jennifer, who is also her PCA, spoke with the consumer and wrote a letter about John. I have seen his hard work and dedication when I go there for a home visit. I have seen John patiently and skillfully apply makeup to Enedina. If love had a picture, the scene of him applying makeup to his wife’s face would be it. John is on top of her care, appointments and medications. He vacated his position as Pastor to take care of Enedina 24/7. Every time I complete the visit the consumer seems to be extremely pleased with John. John was nominated by his supervisor Martha Castaneda and his daughter, Jennifer Figueroa. This nomination is very overdue. Lucy cares for her sister Cathy (DDD) and they have been with Ability360 since March 2008. It is always a pleasure visiting the family and seeing how attentive Lucy is with her. Lucy is always on top of everything. I’ve never had any issues with her timesheets and she always submits monthly habilitation forms on time (which is rare and a huge deal). Lucy brings so much love and laughter to Cathy. Lucy takes her to concerts and movies, they play bingo, go on vacations and she shows Cathy that she can have the same fun as someone with out a disability. I always tell her what a great job she does but I want her to know we do acknowledge her hard work and dedication, as an agency. They’re both a joy to visit and we love them dearly. Lucy was nominated by her supervisor Nancy Carrizosa. 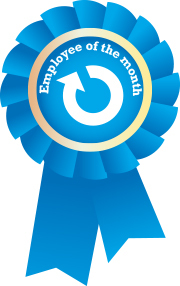 I would like to recommend Margarita Cortright for employee of the month. Margarita transferred from the agency Horizon to Ability360 on Oct. 1, 2011. She has worked for the same consumer, Eustino Tarango, for 8 years. Eustino is totally blind. Margarita works 39 hours a week with him. When I do my reviews the consumer, Eustino always has something good to say about Margarita. They get along very well. She sets all of his doctor’s appointments and accompanies him to them; the only time she calls off is when she has her own doctor’s appointments. I believe Margarita deserves this for the length of time she has worked for this consumer and our company. Margarita was nominated by her supervisor Eliu Ibarra. Joseph Moralez, in the words of his client Julian Dombrowski and family, is an exceptional employee. Jo has been working with the Dombrowski family since 2012. The impact Jo has had on this family is essential. The entire family said that they would not be able to function without Jo as an employee in helping with Julian’s care and that having Jo working with them gives them peace of mind. Julian suffers from Duchenne Muscular Dystrophy and has no control of his limbs. A day in Julian’s life consists of bathing, transferring, fed by attendant, dressing, grooming, incontinence care, and constant repositioning. Julian is also on a ventilator when lying down and uses a power wheelchair which he has to blow into a straw to maneuver. Julian’s is having trouble breathing as his illness progresses, so Jo assists in pushing him around the home. Jo covers the overnight shift with Ability360 and works a total of 45 hours with Julian. The overnight shift is a difficult shift because Julian needs to be constantly repositioned, usually every 20 to 30 minutes. Julian has a pressure ulcer under his rib and tells Jo when repositioning is needed. Jo also has to monitor if ventilator is working through out the night and that Julian is not disconnected from it when he repositions his head or if the power goes out. Jo always ensures back up batteries are working and charged. Jo’s also works additional hours with another agency for the Dombrowski’s family. Jo works an average of 26 hours with Comfort Keepers. Comfort Keeper’s program manager, Shirley, was also in accordance with the nomination. Stating her gratitude for the recommendation of Jo, and his certification through their agency to service Julian with Comfort Keepers as well. Jo is always on time although he rides the bus. Jo gives at least one months notice when he needs a day off and understands the severity of Julian’s illness and need of care. As Julian’s parents’ state, “Jo is a kind, humble, and reliable employee.” He takes care of Julian in a respectful way.” Jo has been a great contribution to our family and Julian. He is always encouraging Julian to accomplish his goals. Julian is attending U of A and plans to master in creative writing. With Julian having breathing issues this has been a problem since voice recognition will sometimes not recognize Julian’s voice, but Jo types if needed and helps Julian flip electronic pages on his laptop since Julian cannot control his limbs.” Jo is an outstanding employee who has contributed to Julian’s care, health, and educational progress. Joseph was nominated by his supervisor Yolanda Acosta and consumer, Julian Dombrowski and family. Radojka started working for ABIL, now Ability360, on Nov. 27, 2003 and this recommendation is long overdue. She takes care of her mother-in-law, Ana Popovic, who is 89 years old. Radojka is an experienced caregiver. She’s very dependable and compassionate. She gives the best possible care to her mother-in-law. Ana, the consumer, is very satisfied with her services. Meals are made from scratch every day and the house is always neat and clean. Many consumers wish that they had this level of care. Ana’s life would have been cut short if she was institutionalized in a nursing home. Being with her family has definitely prolonged her life and has kept her spirits high. Each day is considered a blessing. Radojka was nominated by her friend and translator, Vera Witted. I would like to nominate Emily Murrietta she has been with Ability360 since we came over five years ago, before that she worked as a caregiver with Pinal County for over 10 years. Emily is very dedicated to her job. Emily does not drive, but she is always on time to see her consumers, rain or shine – even on 112 degrees days. Emily has had a difficult consumer that no other agency wanted. Emily stayed with this consumer for over a year. The consumer was not a pleasant lady to work with and was never satisfied with anything Emily did, even if Emily did it just as consumer told her to do it. There were many times that the consumer had Emily transfer her from bed to wheelchair to couch, to bed and back to wheelchair, this did not include the four or five times that the consumer thought she needed to go to the bathroom. The consumer was total Hoyer lift. Emily has a lot of patience; she had another consumer that would make her wait up to 20 minutes outside before he would open the door for her, and she would wait outside with a smile. Emily can also over look the fact that a consumer might have five cats in the house that are all over kitchen table. Emily will just clean the table before she sets the consumers meals on the table. Emily has been a great worker. I am so grateful that I have her as one of my PCAs. Emily was nominated by her supervisor Eloisa Davis. I would like to nominate Nanci Parker for employee of the month. Nanci is a family caregiver to her husband, Helms Parker, through Ability360 since 2012. However, their story began many years ago. Helms health has declined throughout the last 5 years and he is now bedbound. Doctor appointments include transportation in a stretcher. Helms has a catheter, transfers with a Hoyer, has bed baths, and a feeding tube. Nanci takes pride in taking care of her husband and does not see it a job, she sees it as a blessing. As you can see, their story is picture perfect. Nanci is not only an outstanding caregiver, but also an outstanding and caring human being. 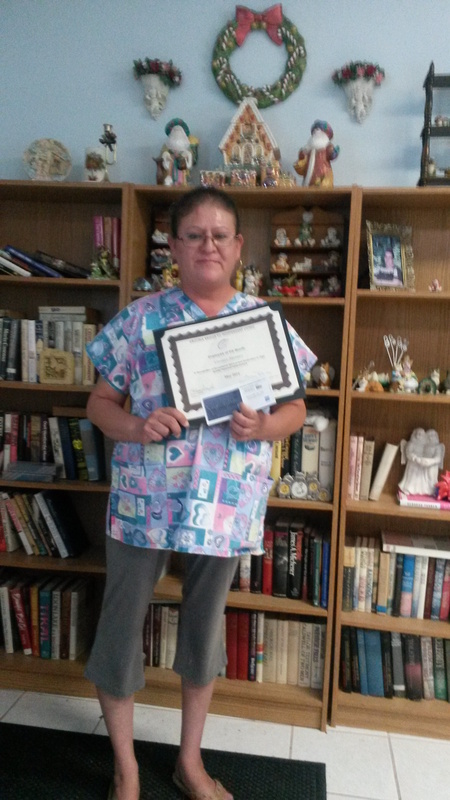 Nanci was nominated by her consumer and husband Helms Parker and supervisor, Yolanda Acosta. I have many PCAs that work with us and are take care of their families, but Renee stands out to me because she really takes care of her mother. Her mother has expressed to me how she does not know where she would be without the care she receives from her daughter Renee. A lot of times she will cry because she feels bad and becomes sad because she feels like she is taking away from her child being able to live her life. Renee always expresses that it is her pleasure and that she would not have it any other way. Renee finds joy in making sure that her mother is happy. She does what ever she has to do to make sure that her mothers is getting the best care and is in the best health possible. Renee doesn’t just care for her mom during her work time. She also takes the extra time to take her out to places they like to go. Whether it is just to the 99-Cent store, to walk around, or to go out and enjoy a nice meal once a week. She takes care of her mother the way children are supposed to take care of their parents in their older years. She stands out to me is because not many people do that anymore. A lot of kids will throw their parents into a nursing home and barely go to see them once a month. Renee was nominated by her supervisor Sparkle Bates. Donna Hiller is 70 years young with the energy of a teenager. She is a very outgoing person filled with compassion. Donna started out as a family caregiver back July 2013 when she took care of her elderly mother until she passed away. Then she became a general worker. Donna currently takes care of three consumers, she was working 7 days a week until her brother began having health issues and she took on the role of caring for him, then her daughter, who lives in Tucson, was struck with a rare form of cancer and Donna also took on the role of caring for her. 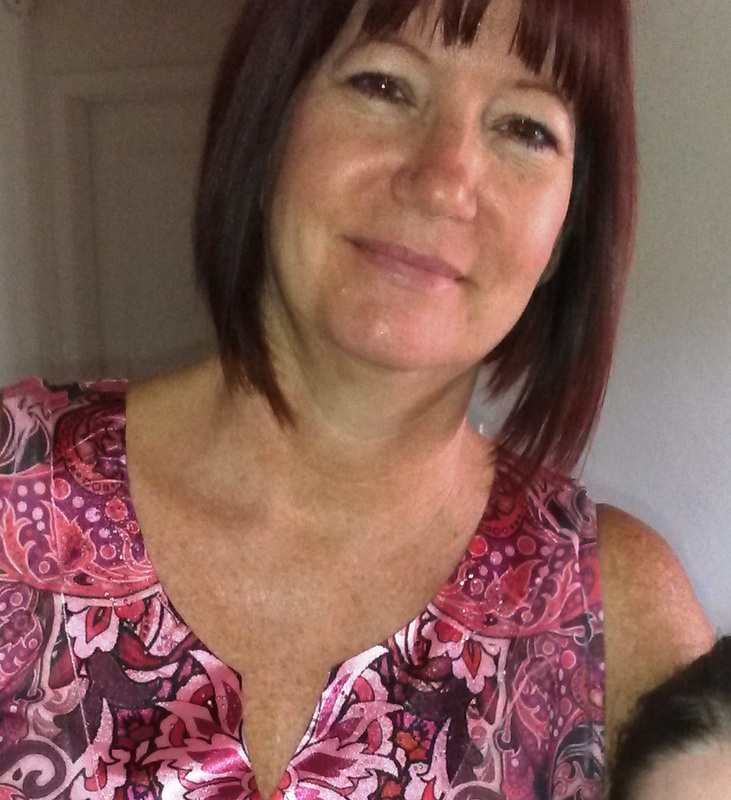 Donna drives every weekend from Casa Grande, Ariz. to Tucson to care for her daughter. Even though Donna only works with us Monday through Friday, she is a full time genuine caregiver because she takes on that role every single day of her life. An example of Donna’s dedication is when one day her car broke down in Casa Grande, which does not have city buses, so she rented a car for a week in order to still be able to work with her consumers. who requires full transfers out of bed into her motorized scooter, loves tag teaming lunch-making with Donna each day. Every one of Donna’s consumers said that they would love for Donna to get the employee of the month and, if possible, employee of the year! Donna was nominated by her supervisor Noreen Montano. We would like to take a moment to acknowledge and praise Nellie Ruiz. She has been caring for her mother since March 2016 and we are very happy and pleased with all of her work. She always has a positive attitude, no matter how she feels, or no matter what is happening in her own personal life. She maintains a wonderful, patient, loving and caring attitude. She’s very honest and trustworthy. Nellie never complains and is always on time and eager to help care for her mother. We have grown to love Nellie like a member of our family, and the day we don’t have her help is a day we are going to be very sad. No one will, or has, compared to Nellie Ruiz. Thank you so much, Nellie. Nellie was nominated by her consumer Florencia De La Cruz and the De La Cruz family. 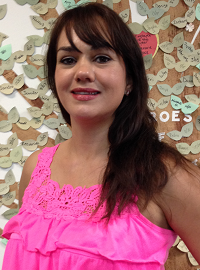 Christina Vargas has been with ABIL since May 2013. Christina was nominated by her Consumer and supervised by Lupita Molina. 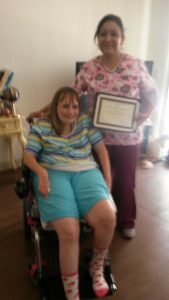 Christina Vargas is a dedicated caregiver who has shown a tremendous amount of respect and consideration towards her consumer that she is the one who nominated her for this honor. Christina’s consumer who she has known for a few years sent in a beautiful nomination letter that was much-admired by all who read it. “I could turn it all into a book as there is so much to say about Christina she is as close to perfection as one can be” The letter included how Christina continues to make her consumer feel as though she is a priority and continues to validate her feelings and needs and never makes her feel as though she is a burden or as if she is doing the consumer a “favor” as she stated. Thank you Christina for all your hard work and your compassionate heart it is much appreciated! Christy has been an employee with ABIL since 2009. Christy is an amazing caregiver and always goes above and beyond for her consumers. When Christy’s car broke down she rode her bike to her scheduled shifts to ensure her consumers needs were met. Thank you Christy for your hard work and continued dedication to ABIL. Christy was nominated by her supervisor Marie Adams. Pamela Freyermuth is the April PAS Emplyee of the month. She was nominated by her supervisor Jermika Juniel. Pamela has been a family caregiver with ABILITY360 since 2010. Jermika states that Pamela “provides excellent attendant care for her daughter and is completely hands-on.” What makes Pamela stand out is that each day no matter how overwhelming life can be or when the consumer may be discouraged she is positive and encourages her to “live life to the fullest “! Thank you, Pamela, for your hard work! May Employee of the month is Veronica Martinez who was nominated by her supervisor Lorenia Lopez. 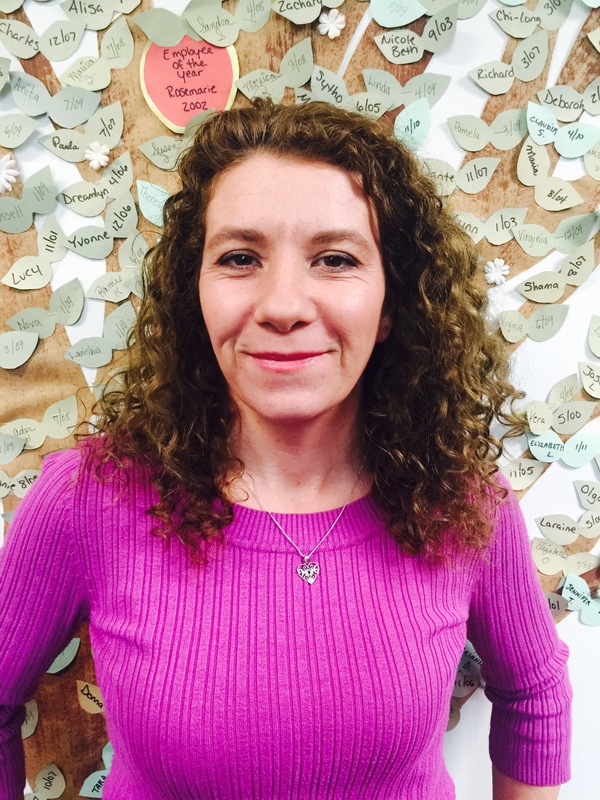 Veronica Martinez has been a caregiver with ABILITY360 since 2011. Veronica is a very reliable worker who will work seven days a week if needed to ensure her consumer’s needs are met. The area that Veronica works in requires her to drive dirt roads, but she never complains and gets to work no matter what. The consumers she works with continue to report to Lorenia how much they appreciate all she does for them and never want to replace her. Thank you, Veronica, for your dedication to your consumers! We greatly appreciate all that you do! Amber Parkhurst has worked with ABILITY360 since 2005. She was nominated by her ABILITY360 consumer as well as her ABILITY360 supervisor, Bonnie. Amber’s consumer states, “I’m very appreciative of her manner, assistance, patience and compassion. I am thankful that she does not need to be asked over and over what needs to be done.” Her supervisor Bonnie expressed, “I have had the pleasure of working on and off with Amber for the past 10 years. Her skills as a caregiver are top notch and she excels with members requiring full care. Amber is always willing to help when called for an assignment and is very professional and reliable. Every member she has worked for has called into the office or contacted the supervisor to compliment Amber on what a wonderful caregiver she is. ABILITY360 is very fortunate to have her as an employee. She is a great representative for our PAS Program. Anthony has been promoted from an ABIL Personal Care Assistant Supervisor to the Mesa Program Manager / DCW Instructor. Anthony joined our PAS Department in October 2011 as a Supervisor in Pinal County. He later began supervising PCAs who reported to our Mesa office. Anthony was an outstanding supervisor and demonstrated the ability to move into a management position with ABIL; he is a forward thinker, a good problem solver, very personable, helpful and organized. He will be an asset to our management team. Farewell to Diane Patton and best of luck to her in her retirement. Diane began her employment with ABIL in March 1997 as a Personal Care Assistant Supervisor. She was later promoted to a PAS Program Manager / Instructor in the Mesa Office. Diane is best known for her passion to teach the Direct Care Worker (DCW) Training to our Personal Care Assistance (PCA), ensuring the PCAs have the skills, knowledge and ability to provide a safe and quality service to ABIL consumers, along with a strong focus on the Independent Living Philosophy. She has worked with the Direct Care Worker Committee for ten years, developing the AHCCCS approved DCW Training and Testing Program for Personal Care Assistance and DCW Instructors throughout the state. 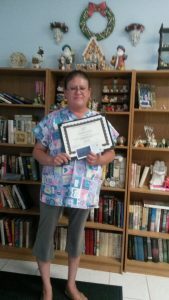 She has been the go-to person to work with and test individuals from other home care agency to become approved DCW instructors. Diane is also known for leading the charge for assisting individuals to register to vote, encouraging PCAs and consumers to let their voices be heard. Diane has enormous compassion for her staff and consumers. Her uplifting personality, her creativity, her love to plan a great party, and her dedication to her position and the Independent Living Philosophy has made her a valuable ABIL staff member.